The Great Engineering Works of New York City. 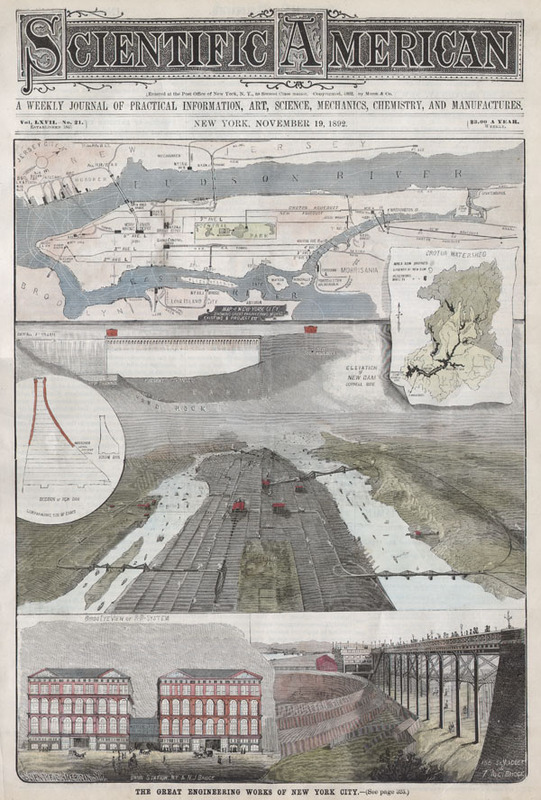 Offered here is a rare edition of Scientific American Magazine issued to praise the great engineering projects of New York City. The front cover features a map of New York City's elevated train line – the precursor to the modern subway system, a View of Manhattan showing several important stations and bridges, and a close up of the 155th Street Viaduct, and of Union Station. Includes the full 10 page magazine. Scientific American is a popular science magazine first published in 1845. It is the oldest continually running publication in the United States. Scientific American was originally conceived by Rufus Porter as a journal of American scientific achievement for the layman. It focused heavily on the documents of the U.S. Patent office but quickly widened its scope to includes a variety of scientific areas. Scientific American is still published today and its mission remains the same. Scientific American: A Weekly Jounral of Practical Information, Art, Science, Mechanica, Chemistry, and Manufactures.' New York, November 19, 1892. Very good condition. Includes entire November 19, 1892 Issue.